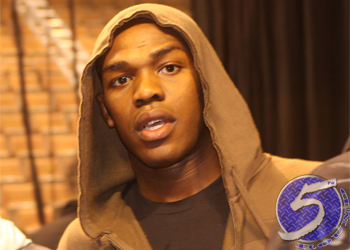 Earlier this week, UFC middleweight champion Chris Weidman teased fans about a future move to light heavyweight in order to set up a “super-fight” with reigning 205-pound king Jon Jones (pictured). Unfortunately for Weidman, Jones thinks he’s using the term “super-fight” too loosely because “Bones” doesn’t believe Weidman’s name is box office enough to warrant plastering “super-fight” on the marquee if they were to ever meet. For Jones, a tango with Weidman would merely be another fight. However, Jones claims a shootout against a certain UFC heavyweight champion is the only super-fight currently available for him. “Well, a lot of people are starting to mention Chris Weidman’s name and I, and I think in order for it to be a super-fight, Chris Weidman needs to get his name a little bit bigger and prove himself against some other world champions,” Jones told AXS TV’s Inside MMA. Jones has defended his throne six straight times, a record for the UFC light heavyweight division. Weidman, meanwhile, has only defended his belt once. They will each get the chance to add to their resumes this spring when Jones meets Glover Teixeira at UFC 172 and Weidman battles Vitor Belfort at UFC 173. Just in case you were wondering, Velasquez is expected to miss most of 2014 after undergoing shoulder in December.